This will be our sixth annual "Fly in to Summer" event. As opposed to our annual fall Open Hangar Day with scheduled workshops and forums, the June event is very informal and unstructured. Owners of completed Zenith Aircraft are encouraged to fly-in for the activities and to show off their completed project to fellow builders (we will provide tie-down space and help facilitate ground transportation if possible). Let us know of any special needs or requirements. 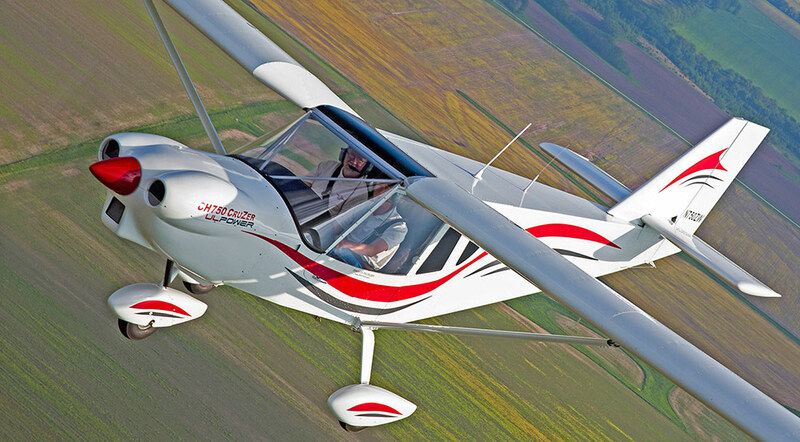 We look forward to showing our new high wing design, the Zenith CH 750 Cruzer light sport aircraft (pictured above). The new CRUZER is the "on-airport" version of the popular STOL CH 750 "off-airport" light sport utility kit plane, famous for it roomy cabin with comfortable side-by-side seating and easy cabin access from both sides. While influenced by its well-known STOL predecessors (the STOL CH 701, the STOL CH 750 and four-seat CH 801 sport utility aircraft), the CH 750 Cruzer is an all-new design optimized as an economical cross-country cruiser for typical (airport) operations. Early Saturday morning, Glenn and Anita Riley are hosting their annual "Fly-In / Drive-In Breakfast at Riley's Roost" at their grass field north-west of Mexico, and invite all Zenith builders and flyers to join them for breakfast once again, starting at 7 am (before the Zenith Open Hangar). The Zenith Aircraft factory will be open from 8:00 am - 3:00 pm for self-guided factory tours, demonstrations, and more. The local EAA chapter will provide a "wiener roast" lunch and we'll also plan to have coffee and donuts available in the morning. Please bring tie-downs for your aircraft if flying in, and bring yourself a lawn chair if driving in. Click here for additional details on the "Fly In To Summer" Builder Fly-In Gathering / Open Hangar on Saturday, June 22, 2013. View some photos from past year's event and from the 2010 and 2009 event. Parts Pick Up for Builders: If planning to pick up any parts, please order and pay ahead of time so we can have the parts ready for you on Saturday. (Note that the 22nd annual Zenith Aircraft OPEN HANGAR DAY and Fly-In Gathering is scheduled for Saturday, September 21, 2013, at the Zenith Aircraft Factory in Mexico, Missouri).